On a recent morning in Madrid, Dora Cadena pondered the job openings pinned to the bulletin board of an employment office. The 40-year-old Bolivian recently lost her job as live-in help for an elderly woman, and has been living off unemployment benefits for the past month. Ignoring the steady stream of job seekers entering the office behind her, she drew a finger slowly down the list. "I've worked every day since I arrived in Spain eight years ago," she says with dismay. "Now there's nothing. I don't know what to do except wait and see." Dora, the Spanish government has an offer for you: go home. Spain's new Plan of Voluntary Return, which goes into effect Monday, entitles legal immigrants who have lost their jobs to receive unemployment benefits as a lump sum payment  as long as they agree to leave the country. Participants must turn in their residence permits and work visas and promise not to return to Spain for three years. In exchange, they receive 40% of their total unemployment payouts before departing and the remaining 60% once they are home  an expected average of just over $40,000 in total. The measure is one attempt to solve Spain's growing unemployment problem. With joblessness recently reaching a 15-year high of 11.3%, the country's 4 million documented immigrants are feeling the pinch acutely. Unemployment among them is up 67.1% on average over 2007. 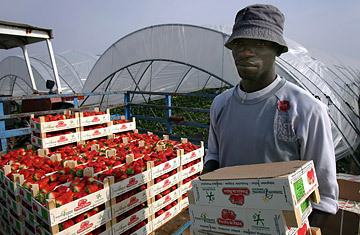 Between April and August of this year, the number of immigrants receiving unemployment jumped from 165,217 to 280,298. The Plan of Return also represents a sea change in the Spanish government's once famously lenient immigration policies. Three years after offering work and residency papers to 750,000 migrants in a massive legalization, Prime Minister José Luis Rodríguez Zapatero has gone on record supporting the European Union's controversial Return Directive, which allows members states to hold undocumented migrants for up to 18 months. His government is also spending greater resources on preventing migrant-laden boats from reaching Spanish shores, and is studying a plan to restrict regroupment immigration to parents and their under-18 children. (Currently, the law also allows grandparents and in-laws of legal migrants to join their families.) "Politicians respond to public-opinion polls," says Federico Winer, a journalist who writes on immigration issues for Tribuna Latina, an online newspaper directed at Spain's Latin-American community. "And what the polls are telling them is that people are saying 'Basta. It's time to close the door.' "
Most immigrant associations in Spain have come out against the plan. "Until recently, while the economy was booming, immigrants were the solution," says Kamal Rahmouni, president of the Association of Moroccan Immigrant Workers in Spain (ATIME). "Now it's as if they're saying immigrants are the problem. The plan tells society that immigrants are responsible for the economic crisis." When he first announced the plan in June, labor minister Celestino Corbacho estimated that more than a million immigrants would take advantage of the payout. He has since, however, reduced that number to 87,000, and early signs suggest it may be far lower than that. Ecuador makes up the second-largest source of migrants to Spain, but so far, only 186 Ecuadorans have signed up to return. Moroccans, who comprise the single largest immigrant group in Spain, are perhaps even more reluctant. In a poll conducted by ATIME, only 8% said they would be willing to renounce their visas and return to Morocco for three years in exchange for the payout. Why the reluctance? In part, opposition stems from a rejection of the plan's specific provisions. "No one wants to give up their residency visa for three years, especially after they've suffered so much to get it," says Rahmouni. But there's an even more compelling answer, and it has to do with why new residents immigrated in the first place. "I came for a better life," says Cadena, "and I got it. Food, clothing, my apartment  they're all better here than in Bolivia. I'm not interested in going back." Comparisons like that may well be the plan's undoing. "The worst economic crisis here is still better than the regular economy there," says Winer, referring to Latin America. It's a sentiment that translates to other parts of the globe. Waiting his turn to speak to a counselor at the unemployment office, Mohammed Ashref admits that after losing his job as a painter two months ago, he's having trouble paying his mortgage. But still, after eight years in Spain, he wouldn't consider going back to Pakistan. "This crisis is affecting the whole world," Ashref says. "But in Spain, eventually, things will get better. You can't necessarily say that about Pakistan. You can't say it about any poor country."